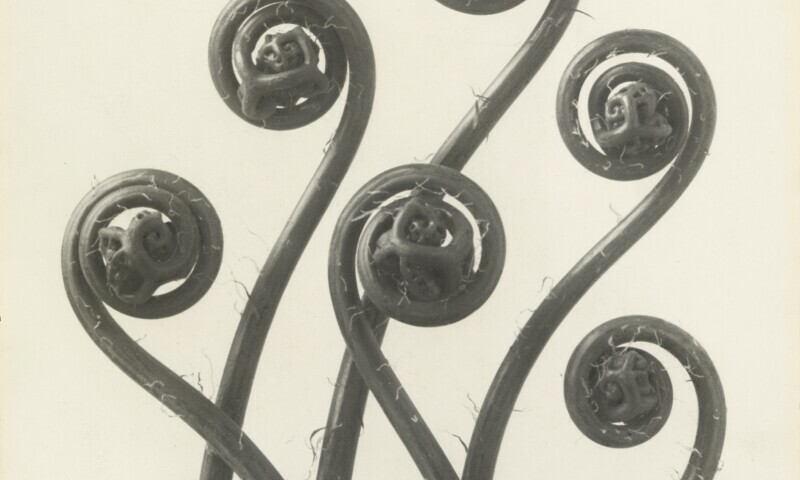 Karl Blossfeldt, Adiantum pedantum. Maidenhair fern, before 1926. No Two Alike: Karl Blossfeldt, Francis Bruguière, Thomas Ruff restages the 1929 exhibition of plant photographs by the German sculptor Karl Blossfeldt (1865–1932) and photographs of cut-paper abstractions and multiple exposures by the American photographer, then living in London, Francis Bruguière (1879–1945). The exhibition, held at the Warren Gallery in London, celebrated the launch of their two books Art Forms in Nature and Beyond This Point. A surprising pair, Blossfeldt and Bruguière intrigued critics as being “quite different from the usual run of photographic shows.” No Two Alikereunites these two important modernist photographers for the first time since the legendary exhibition and juxtaposes their work with the Photograms and Negatives series by the German contemporary artist, Thomas Ruff (b. 1958), whose interest in and reaction to the history of photography has formed the background for many of his series. Ruff appropriates six of Blossfeldt’s plant motifs in his Negatives series. By comparing the work of these three photographers, emphasis is placed on a common interest in the variant, which Walter Benjamin once described as the creative principle behind Blossfeldt’s close-ups of plants. Bruguière, too, was working through infinite variations in his photographic abstractions. Like his historic counterparts, Ruff has always worked in series and variants, and in this instance presents variations of themes originally explored by Blossfeldt and Bruguière. The encounter of these three artists makes the similarities and subtle differences within their own bodies of work visible, but it also presents each of the three artists’ oeuvre as a variation of the other.